Working Title: Are You Afraid? Are You Afraid? is an immersive online documentary that combines research, an immersive user experience and user generated content to explore the age-old subject of fear. Users are intended to face or at least acknowledge their own fears whilst understanding what elements of their psyche and society drive them. There is a heavy user-generated-content element to the project, with viewers answering questions and submitting content to the documentary to enhance the experience. The project also relies on interviews with psychology professionals, academics and even those involved in the horro movie industry, in addition to a broad range of collated third-party content, ranging from tabloid headlines, to data on what people fear. As fear is a decidedly universal phenomenon, I originally considered my audience to be as broad as the language and bandwidth demands would allow. However, as the information contained within the documentary is intended to be relatively sophisticated, in addition to my intention to inflict suspense and mild fear on my audience, this projection was reevaluated. I foresee my audience age-wise as being older than 15 but not too old to be unable to navigate the project easily. People with strong interests in psychology, people with an interest in fear-mongering in the media and of course horror-film buffs all belong to interest groups that are targeted by Are you Afraid?. As such, there are some confines on whom my audience is, but predominately this project acknowledges that fear is something everyone has experienced, and thus should on some level appeal to a great number of people. 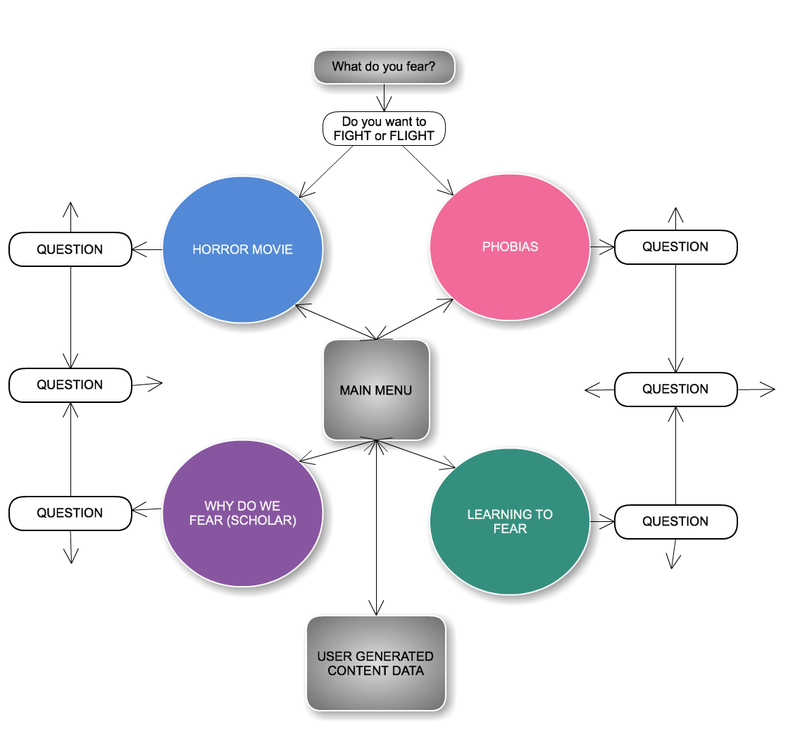 Follow the question paths and be led to certain pockets of information (e.g. answering ‘Yes’ to the question ‘Have you always been afraid’ will lead a user to the ‘Phobias’ information page. Head to the main menu and explore the various themed information pages at your own will. Users can successfully navigate the program either way. In this way they can either choose to let their fears choose their fate, or directly find information by themselves. They can also backtrack and begin the questioning process for themselves. This will avoid frustration for people keen to seek out certain information, but also allow a rewarding exploratory element to the project. Finalised wireframe of Are you Afraid? Whilst the project in informative, it also aims to put its viewer on edge by engaging with graphic elements that are typically associated with fear. The colour scheme will comprise of dark shades to reinforce the common fear of the dark and the imagery will be gothic, mysterious and unnerving. 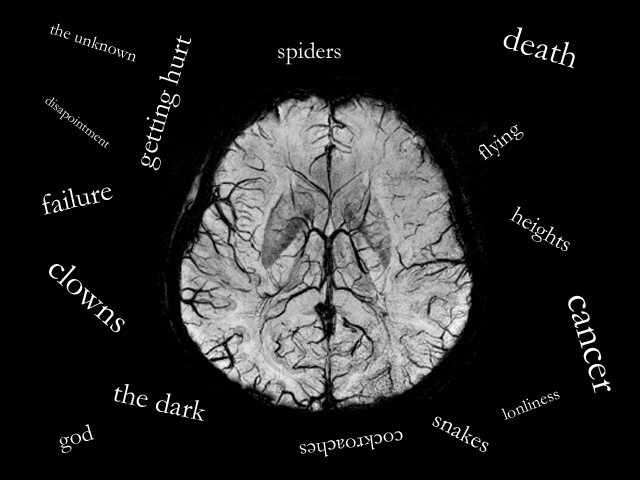 The main menu screen will also feature a MRI scan of a brain. 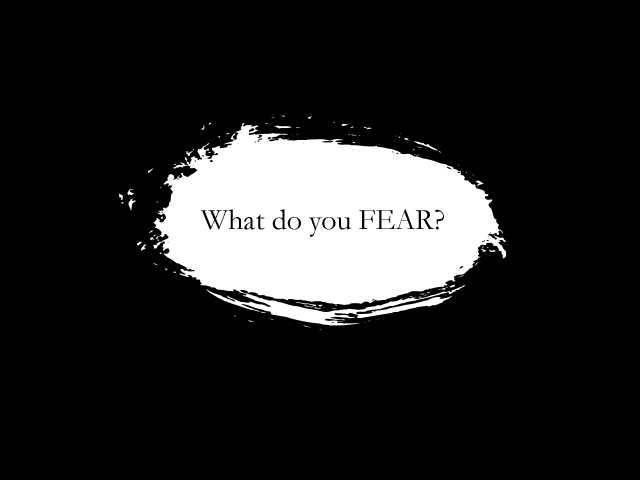 This reinforces the psychological element of fear, instilling the message that our fears are intrinsically linked to the neurological working of one’s mind. The overall project will be backed by a non-descript atmospheric soundtrack, which will be periodically intercut by the audio of famous quotes and speeches about fear. The only exception to this is when the interviews play, at which point the soundtrack will be dramatically softened. The main implementation of user generated content will be in the collecting of metadata via viewers answering the question ‘What are you afraid of’. The most common words used in these responses will float around the salient brain image in the menu screen. They will disappear however when the mouse hovers over the buttons that link to the different sections of the site. Additionally, a user can visit a separate page where they see the full responses of other users and a range infographics created from the inputted data (e.g. how many users chose to ‘fight’ vs. how many chose to ‘flight’, the change in top users’ fears over time etc.). There are four main screens plus a home screen in the project. Each different screen will tackle a different aspect of fear (phobias, subjecting yourself to fear, understanding why we fear and overcoming fear). On each page there will be various bits of information (e.g. lists, statistics, quotes, news headlines) as well as clips from an interview with a person associated with a certain area (i.e. Mark Hartley for the horror film section).